We've been biking our way across Kananaskis and I have a lot of fun family-friendly trails to share with you. Never again will I hike to Troll Falls because it is the most amazing family bike ride!! And I confess that I was seriously looking at all the hikers on the trail, wondering why we were the only ones on bikes?? Why would you hike this?? Park at the Stoney Trailhead near Kananaskis Village for this one. To find the trailhead, turn off of Hwy 40 for Kan. Village and go straight on Mt. Allan Drive instead of turning left for the Village. Immediately after the Village junction, you'll see the turnoff on your right hand side for the Stoney Trail under some power lines. From the Stoney Trailhead, look for the trail to Hay Meadows and take that route on your way in. It's mostly flat or downhill in this direction and riding is easy on a grassy wide ski trail. The advantage of doing this way in is that you get to ride beside the beautiful river. To find the Hay Meadows Trailhead, push your bikes around the gate at the end of the parking lot and go up the old road under the power lines a few metres. You'll see a faint trail going through the grass on your right hand side. You want to go right! If you go left on the well marked trail with a map, you will be on the Troll Falls trail which is your descent route. All downhill on the way out. Don't go that way on the way to the falls. No fun! It's a bit confusing after you reach the meadows but you want to follow the trail back to the power lines again and look for a good trail that will guide you back to the Troll Falls Trail. I've attached a map below. On the map you can see that by following the Hay Meadow Trail, you should cross the power line (green dotted line with a horse) and then make your way for the Troll Falls Junction. You'll find a really good dirt trail (wide enough for skiing in winter) and the final 0.3km to the Falls is best done on foot. 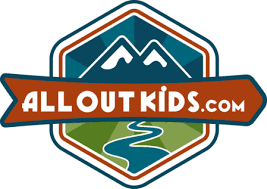 Once at Troll Falls, it's a good spot to let the kids play for a bit, have snacks and rest. It's only a couple of kilometres to the Falls so it should take you less than an hour to get here. When you leave the short hiking trail and get back on your bikes, take the official Troll Falls trail back to the parking lot. There's a short climb or two at the beginning hat we walked but other than that, you'll be flying and screaming downhill most of the way and it should take you less than half an hour to get back to the car. The hills are beautiful too in that they aren't really steep enough to warrant braking. Just long and fun! When you finish your ride, head over to Kananaskis Village for some ice-cream and a visit to the playground if you want. The total bike distance is 4km so this is a short half day outing. In the area and want to try another bike ride? Try the Terrace Loop up at Kananaskis Village. This 3km loop would be best done by kids that have bikes with gears but otherwise poses no technical challenges. It is a double track cross country ski trail and slowly climbs to the first junction with Terrace Link, and then slowly descends back to the village. Of note, the trail starts and finishes at a playground, and there's ice-cream at the village. That's probably enough incentive to at least try the short loop. If the hills pose too big of a challenge, turn around and return to the village with little effort lost. We can officially say that we have a favourite bike trail in Alberta, and we believe it is the most beautiful trail for mountain biking in all of Southern Alberta. It's also a lot of fun, and there was a lot of whooping and hollering going on in our party on the flowy descents. The High Rockies Trail is a newly completed 80 km long multi-use trail outside of Canmore, Alberta. 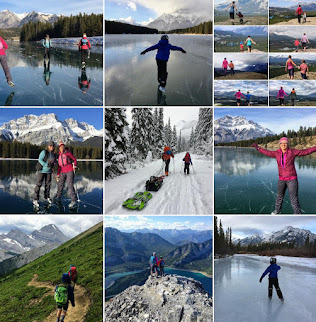 The trail starts at the popular Goat Creek Parking Lot on the Smith-Dorrien/Spray Lakes Trail and ends on the Alberta/BC border at Elk Pass in Peter Lougheed Provincial Park, paralleling the Spray Lakes Road until you reach the Lower Kananaskis Lake. The Watridge Lake Trail is a bit more committing than the Troll Falls Trail in distance and difficulty. My son did the ride on his balance bike the first year and made it the whole 9km return distance. We then returned and did the ride on his 16" pedal bike but it was a challenge and we walked most of the hills in the uphill direction. Parts of the ride are definitely hike-a-bike if you have a child who is not yet on a bike with gears. Park at the Mount Shark parking lot on the Smith Dorrien Road out of Canmore for this one and follow the signs for Watridge Lake. You'll be on an old road the whole time which is used for cross country skiing in winter. It is definitely not a hard trail but there are some hills. Without gears, they are challenging on the way up. On the way down, your child should be good at braking and will need to know how to handle rocky terrain. It seems like the biggest hills on this trail are the bumpiest too. Even IF you have to walk a few hills, you'll still be riding 70% of the time and traveling three times the pace you would be if you were to do the whole thing on foot. I know people hike this trail and you'll likely meet few other bikers on your outing. However, as with Troll Falls, I would never bike the trail to Watridge Lake. Boring with a capital B. On a bike though it is a splendid ride!! Take a rest stop at the lake, have lunch, and do the short hike up to the Karst Spring. It's 11 km round trip if you do the bike and hike combo. The springs are very cool with water shooting straight out of a hole in the rock to form a big cascading waterfall. The Lodgepole, Wheeler, and Lakeside trails combine to form a 12 km out and back ride in Peter Lougheed Provincial Park. They are paved with gradual hills for the most part that most children should have few problems with. The odd steep hill can be walked and there are good signs in place when approaching a big hill. We like to do the ride one way from the Boulton Creek Campground to the Canyon Campground. This is a bout 9 km and is mostly downhill. It's a beautiful ride and you can hike the Canyon Interpretive Trail while you wait for somebody to bike back for the vehicle that you parked beside the Boulton Creek Trading Post. If you want to camp overnight, there are lots of campgrounds in PLPP. 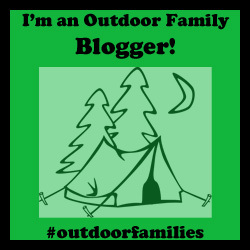 See my previous stories: The Best Family Campground in Kananaskis or The Best Place to Bike and Camp in Kananaskis. The Canmore Nordic Centre features trails for users of all abilities and even has a lovely paved trail that goes almost the whole way towards a beautiful meadow. The final section is on gravel but it's a nice family ride and is chariot-friendly for families with younger tots. The ride to the meadow and back is about 6 km return. See the trail map and follow the pink trail, Banff Trail, to the meadow and back. It is double track the whole time and a good choice for family rides. We did it when my son was still on a balance bike but we plan to go back again to do it on pedals. There's also a green single track loop of 2 km that would be a good ride for older kids who have gears. Without gears the small hills are very challenging on this trail! This paved bike trail is 9.7 km one way and starts up at Kananaskis Village. You can avoid the big hill down from the Village though by starting at the Kovach Day Use Area by the highway below. We rode the 17 km return distance between the Kovach Day Use Area and Wedge Pond at the far end in less than 2 hours at the pace of a 6 year old so it's fair to say that it's easy riding. There are a couple big hills near Wedge Pond but the rest of the trail is relatively flat. You will notice it is more downhill as you head from Wedge Pond back to Kovach though as you will be coasting most of the return journey. I think it took us 20 min. to bike back from the pond to our vehicle. It makes sense therefore to bike to the pond on the way out with fresh legs, have a break at the pond, and then coast back to the car. This paved trail is 4.2 km one way and is located in the Bow Valley Campground. It is rated as an intermediate trail despite being paved and it's a fairly accurate rating. There are some good hills on this trail and you'll get a good workout in both directions. We rode this with our son at the age of 6 on a 20" bike with gears. This is the minimum size of bike kids will need unless you plan on pulling kids in a Chariot (not recommended unless you are extremely fit!) Kids will also need gears for this ride. Despite the fact that it is mostly downhill, there are still some big hills in the up direction as you ride towards Banff. To bike this trail, choose a good "power day" when the kids are feeling strong, and head to the Goat Creek Trailhead. Decide if you are going to stash a second vehicle in Banff or if somebody is going to bike back for the vehicle at the end. My husband chose to bike back for our truck while my son and I headed downtown Banff for ice-cream. Total ride time for our family was approximately 3.5 hours (with an extra hour spent by Dad riding back for the truck.) We ended at Bow Falls in Banff and that was possibly the crux of the whole trip. Directions to get OFF the trail in Banff: When you reach the golf course, do NOT cross the fairway heading straight for the Bow Falls Parking lot. Instead, turn right when you reach the golf course, following a good trail to the official sign for the East Spray River Trail. The trailhead is located off the paved Golf Course Drive. Bike down this road a short distance until you reach the bridge below the Banff Springs Hotel, ride over it, and you are at the Bow Falls Parking Lot. 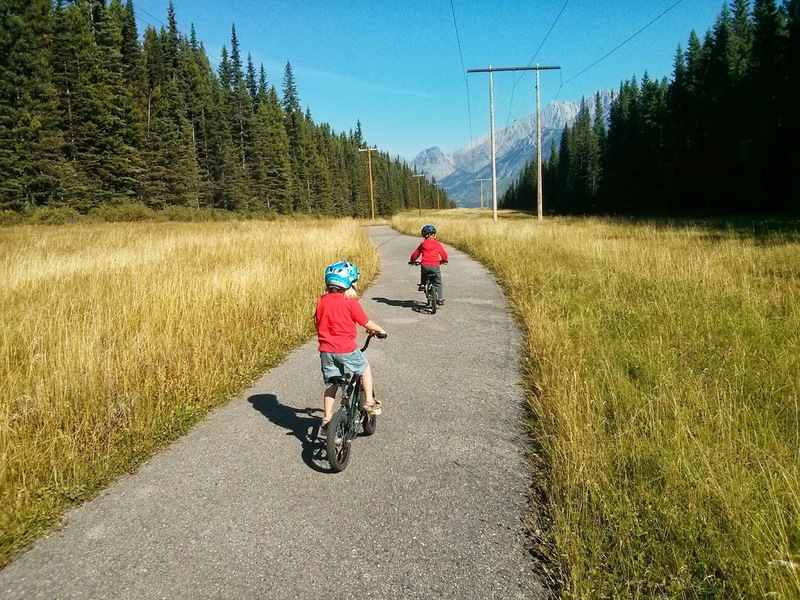 Thanks for sharing The Best Family Bike Trails in Kananaskis. Hope you have a great fun there.Planning for a tour with my friends hope for the best. 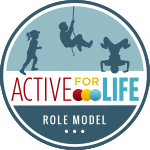 Balance bike are a great way to introduce a young toddler to the concept of cycling, but without the fear of falling off!.I just started my own blog to keep track of my riding and to help with getting sponsors for riding.